Your home electrical system is one of the most complicated issues your home inspection will deal with. Treat it with great care because it can be very dangerous. When home inspectors find safety issues your best bet would be to get repair advice from some one familiar with the system. Don’t try to do any electrical work yourself unless you are trained to do so. It’s best to hire a local electrician in Phoenix to help. Basically your system comes to your house from the main city transformer via subterranean wires or overhead wires. It comes in the main service panel and other sub panels if you have them to different circuits inside the home until they get to the outlets. Older houses or homes that have been remodeled may have old wires or electrical issues inside the walls that a home inspector won’t come across. All homes are different and your electric grid can be complicated. There are several areas where home inspections commonly occur. We make sure the wires enter your home and that they are not hazardous. Sometimes trees can get in the way of service lines and can add stress to the wires. The wires also need to have a drip loop. This dip in the wires is put in just before they enter the service mast on the outer part of your house. This allows water to go to the ground instead of getting into your home, causing rust and other issues with your service panel. We make sure your wires have a clear and safe path to the home. Since the updated electrical codes certain types of wiring have been phased out because they don’t have safe ground wires. They used to be spliced together in the walls without a box and made dealing with them very expensive. Sometimes we still see old knob and tube wiring mixed with new wiring. This can be a safety hazard and we can fix it. These outlets protect people from electric shock by turning on the breaker when they sense a change in the amount of current going from the live wire to the neutral wire. They are common near water sources like kitchens, bathrooms and outside areas. Home inspectors will see if they are installed and test them. If you don’t have them or they don’t work properly we can help. Wires that are exposed (not spliced properly and unprotected) can cause a fire or shock. We often see exposed wires in areas that haven’t been finished, usually after renovations or repaires. You can also have unsecured wires. Make sure they are stapled in or strapped in so people don’t trip on them. 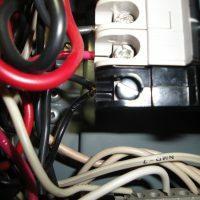 Most commonly electrical issues found by home inspectors come from the service panels. There are many issues there but the most common are when inspectors look at the wire sizes and breaker sizes and make sure they are the proper relative size. They check where the wires come and go. Check the arrangement of the wires and look for melted or burned exposed wires. Make sure the sheathing around the area is protected and nothing can get into the panels. Smoke alarms are usually an easy fix. They are required to be on each floor of the house. Usually on the ceiling somewhere around the bedrooms. I wouldn’t put them in the kitchen as sometimes when cooking the heat or smoke will set them off. They are usually good for 5-10 years and depending on the brand you should test them every 4-6 months. Most of these issues can be repaired at an affordable cost. It can get really expensive if we have to rewire the entire home. So if you are buying or remodelling a house or you will be making a lot of changes make sure that the previews homeowner had their work done by a licensed professional. Check for paperwork and permits. By correcting these issues your home will be safer and you can be at ease continuing the process of selling or buying a home.